At Renew Laser Aesthetics our focus is on you and helping you achieve your personal aesthetic goals. 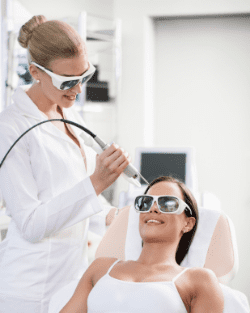 Whether you are looking to improve your appearance by removing dark spots or eliminating a tattoo that you feel no longer fits into your life our team at Renew Laser Aesthetics is here to help. Renew Laser Aesthetics is a private, outpatient medical doctor’s practice founded by Dr. Manfred Henne and Viola Medina, ARNP. We are located in Poulsbo, Washington, and serve Kitsap, Jefferson and Clallam Counties, the Olympic Peninsula, and the greater West Puget Sound communities. Renew Laser Aesthetics specializes in skin rejuvenation and the removal of tattoos using the latest in medical equipment. Our team is comprised of dedicated and caring professionals who have undergone extensive training. The entire staff focuses on the comfort of each patient in a relaxed outpatient office atmosphere. What sets Renew Laser Aesthetics apart is the interaction of the physician, nurse practitioner, and technologists who co-plan treatment and who provide face-to-face communication with patients. Every patient is given the opportunity to discuss his or her treatment options personally with the members of our staff who are caring for them. Since our background is in the medical field you have the peace of mind of knowing that our services are based on proven and safe healthcare practices.